The Bollywood actress Anushka Sharma is allegedly going to marry the star cricketer Virat Kohli. If this happens, then it is going to be the biggest wedding of the year. By now almost everyone is aware of the reports on Anushka Sharma and Virat Kohli’s alleged wedding. The two of them are reportedly going to tie the knot in Italy this week. In fact, both the celebs have already flown to the foreign land. But what is still awaited is a confirmation from the lovely couple. Well, we were very happy to know about their marriage. And our Bollywood celebs are also equally happy and shocked at the news. At an event, B-town stars like Jacqueline Fernandez, Madhuri Dixit, Mouni Roy and many others commented on the reports. Jacqueline Fernandez: The actress appeared to be really excited as she said, “I am so so excited. I think it is an amazing news. I am really really happy for Anushka and Virat. I can’t wait for their wedding.” When media asked if she knows it’s confirmed, she said, “I didn’t know about it. He (the mediaperson) confirmed. I have not got the invitation yet (laughs). 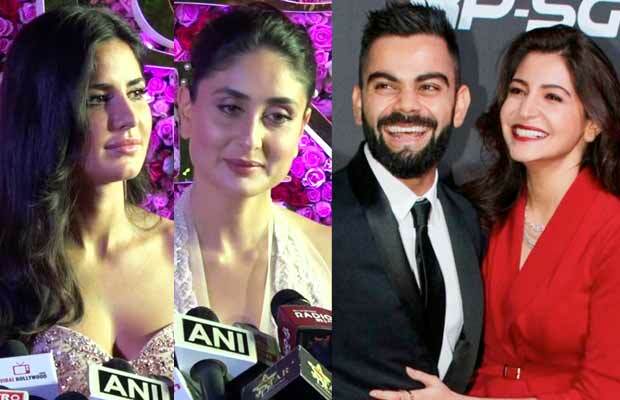 Previous articleWatch: Jacqueline Fernandez Accidentally CONFIRMS Virat Kohli And Anushka Sharma’s Marriage!